Personalised dinosaur childrens birthday card, for boys or girls, by Jenny Arnott Cards - perfect for a special son, grandson, godson, nephew, cousin, brother, etc. 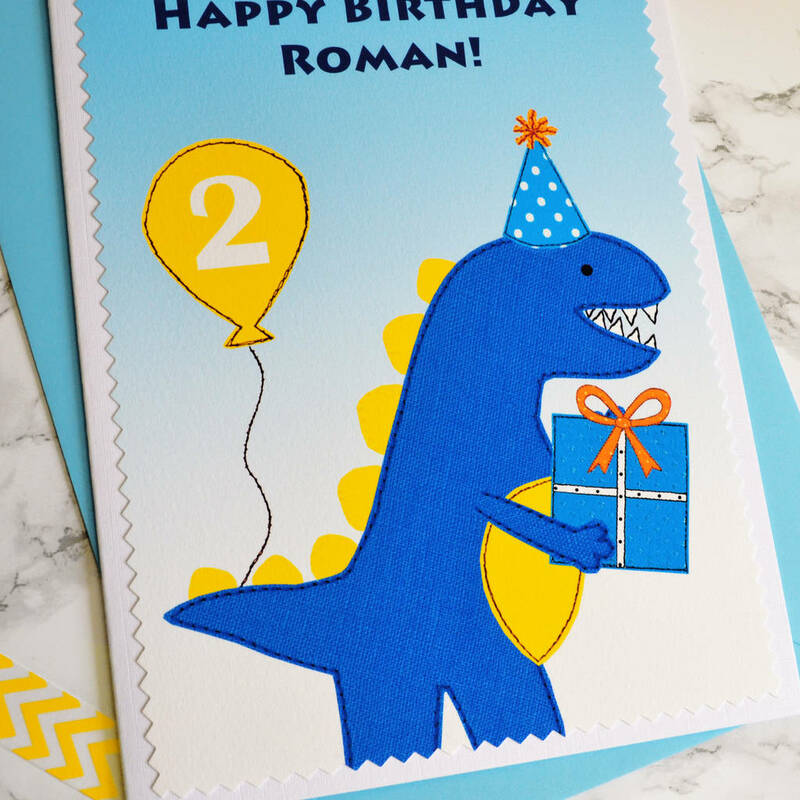 These large A5 sized childrens birthday cards are great for boys or girls who love dinosaurs, whether it's your son, daughter, grandson, granddaughter, nephew, niece, brother, sister, godson or goddaughter. 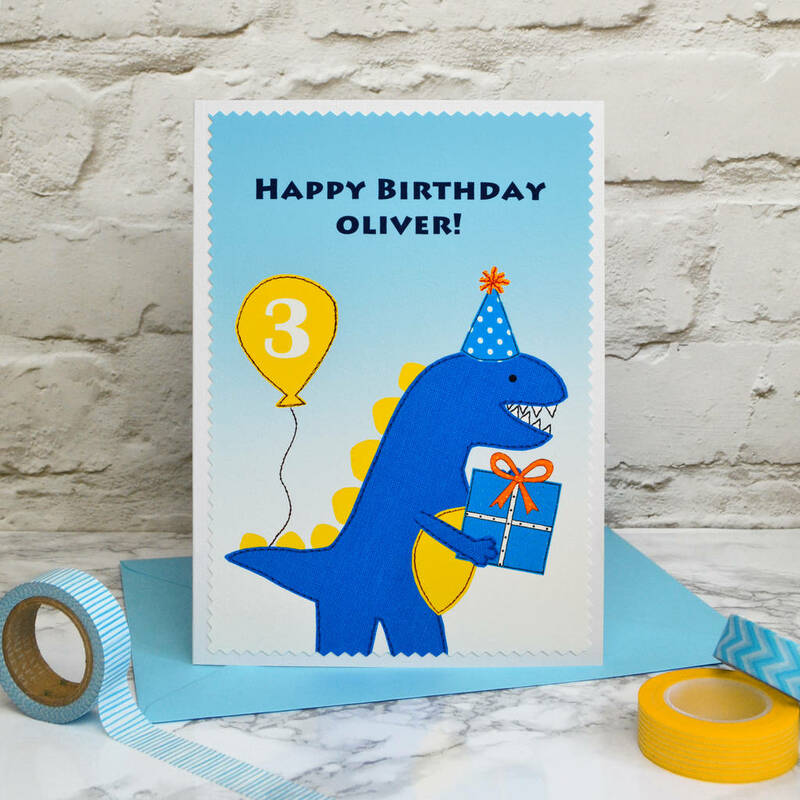 With a blue and yellow dinosaur in a party hat, holding a birthday present and big yellow balloon, the card is personalised with the child's age and 'Happy Birthday (name)!' on the front. The card can be personalised for any birthday including 1st, 2nd, 3rd, 4th, 5th, 6th, 7th, 8th, 9th, 10th or beyond! Also suitable for bigger boys / men who have not lost their childhood love of dinosaurs such as your boyfriend, husband or dad! A lovely kids birthday card perfect for a first, second, third, fourth, fifth, sixth, seventh, eighth, ninth or tenth birthday when your boy turns one, two, three, four, five, six, seven, eight, nine or ten. I also make a wide range of other handmade birthday cards for children or grandchildren - just click on the 'see seller's complete range' link below to see the full collection. 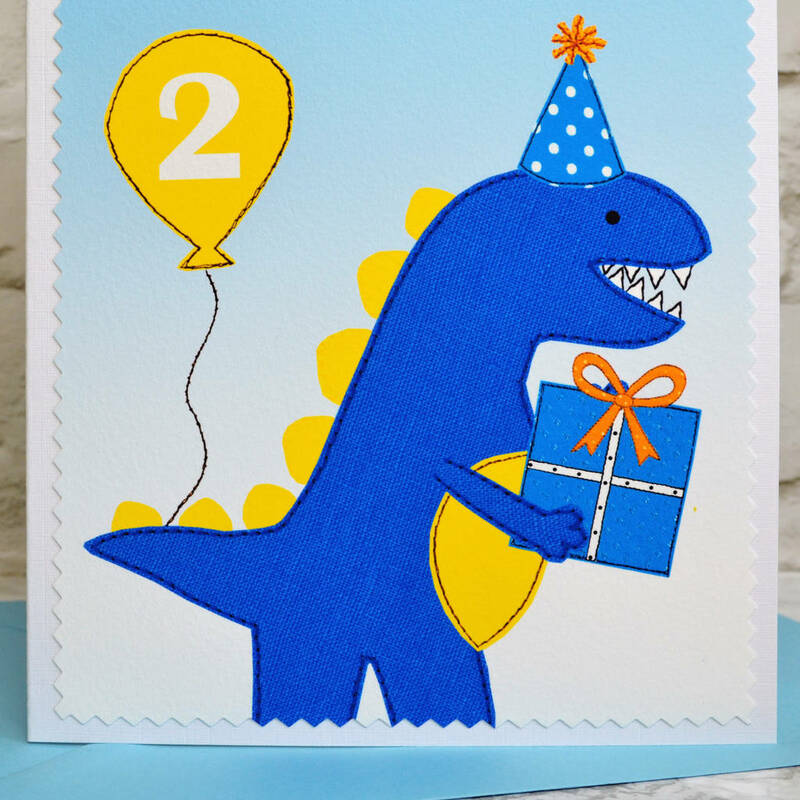 This lovely printed dinosaur birthday card is from Jenny Arnott Cards & Gifts. The print does retain some fabric textures which were used in the design, however the card is not actually fabric but is printed onto beautiful quality artisan paper, trimmed with a zig zag edging and adhered to a 350gsm textured white card blank.